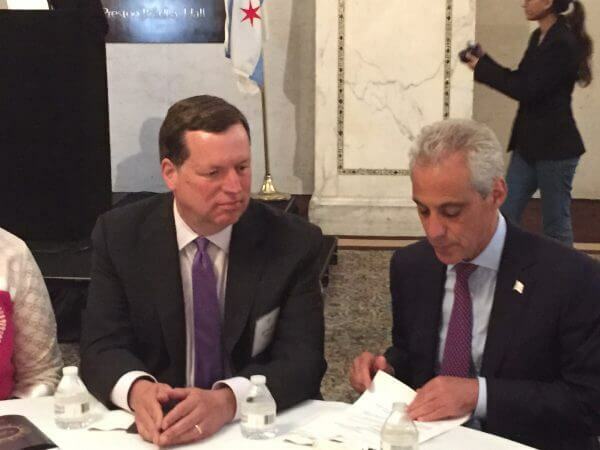 More than 275 Muslims attended an Iftar dinner hosted by Mayor Rahm Emanuel on Tuesday night (June 28, 2016) at the Chicago Cultural Center in the Loop, promising that he will pursue inclusion of all ethnic groups including Arabs and non-Arabs. Emanuel greeted all of the attendees and was joined by Chicago Alderman Joseph Moore of the 49th Ward. Moore is often applauded as being the “Alderman of Chicago’s Muslim Community” because of the large number of Muslims who live in his North Side ward and his strong support of Muslims throughout the city of Chicago. 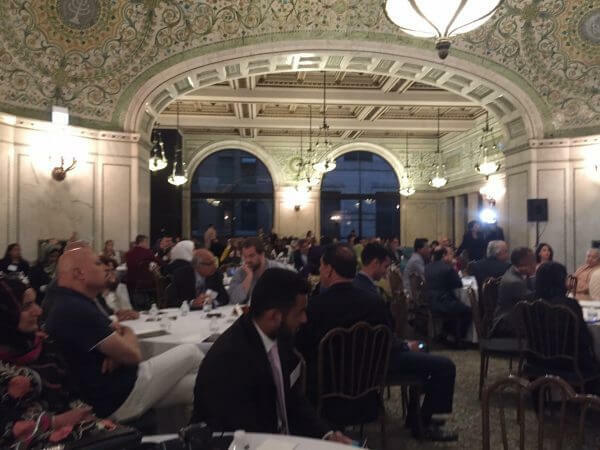 Several American Arabs also attended the dinner and applauded as Mayor Emanuel spoke against hate, violence and the need for everyone to be included and his remarks were interrupted repeatedly by enthusiastic applause. “I want this city, a city with a Jewish Mayor and a vibrant Muslim community to send a message loud and clear across this globe. If you offer hate, we offer love. If you offer fear, we offer hope. If you offer intolerance, we offer inclusion. And if that is the message of the the city of Chicago, the city we call home, the city our parents came to like my grandfather,” Emanuel said. Emanuel shared the story of his grandfather who immigrated to America at age 13 after fleeing the pogroms of Europe, not able to speak a word of English and seeking out a third cousin to help him in the city. “That within two generations his grandson would be the mayor of this city speaks volumes of who we are as a city and who we are as a community,” Emanuel said noting that all of the attendees had similar stories including Sadiq Khan, the newly elected Muslim mayor of London, England. Emanuel said he phoned Mayor Kahn to congratulate him on his achievement as the first Muslim Mayor of England’s largest city. 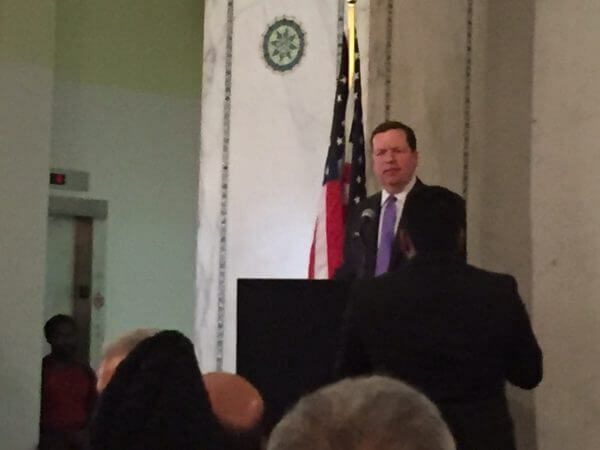 The mayor was introduced at the event by Muslim political activist Salman Aftab, who served as the co-chair and coordinator of the Iftar Dinner. “Mayor Emanuel has much love for the city and he has done more for his citizens than most. In this time of Islamophobia and vilification, he did not turn his back on us. On the contrary, he sits here with us against those voices who try to separate us,” Aftab said. After beginning the program by asking attendees to offer a moment of silence and prayer for the victims of the terrorist attack that morning at Istandbul, Turkey’s Ataturk Airport, and for the victims of other terrorist attacks including in Orlando, Florida, Alderman Moore reminded the audience not to take the evening for granted. “Muslims, like Christianity, like Judaism and like all the major world religions, their fundamental tenets talk about peace and love and forgiveness, not hatred, not terror. It is very important and incumbent upon all of us, and particularly those who strive to become leaders in our society and our nation when these horrible events happen in our world to not divide people, to not point fingers of blame, to not imply that it is because of a particular religion or it is in the tenets of a particular religion to promote terrorism and terrorist acts against people,” Moore said. 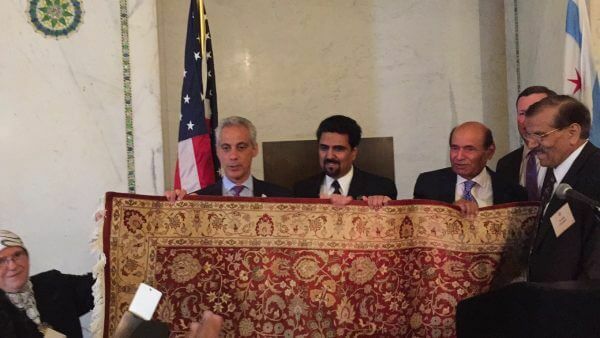 At the end of the presentations, just before the evening prayers, Aftab and other organizers presented Mayor Emanuel with an oriental rug as a token of their appreciation. Emanuel stayed for the entire event, including during the prayers before the buffet foods were served. Among those attending the dinner were many American Arabs including activists Abder Ghouleh and his wife Amani Ghouleh, longtime Arab businessman Hassan El-Katib, Okab Hassan the principal of Peck Elementary School in Chicago which has a large American Arab student body, Oak Brook Trustee Asif Yusuf, and Dr. Seema Imam, who served as the program emcee introducing the organizers and presenters. Moon Khan, a political activist and candidate from DuPage County, was also at the event. Maghrib prayers were led by Umam Senad Agec with a Quran Recitation by Sheik Feysal Mohamed. Also attending the event were representatives of the Metropolitan Water Reclamation District including District President Mariyana T. Spyropoulos and Commissioner Frank Avila. 06-28-16 Rahm Emanuel Host Iftar from Ray Hanania on Vimeo. “There has been a lot of fun putting this together. My good friend Salman Aftab and I talked about having this celebration together and having the mayor attend. As the events unfolded today in the nation of Turkey so demonstrated, terrorism and the victims of terrorism cross all cultures and religious faiths. Turkey is over 90 percent Muslim, as you know. Today the victims of terrorism are predominantly Muslim. Last week, most of the victims were from the Latino community and many were a part of the LGBT, Gay and Lesbian community. The victims in Oklahoma city a few years ago, so-called home grown terrorism done by a Christian man. Terrorism is not the providence of any particular religion or faith as some people might want to lead you to believe. It is an evil, and evil that unfortunately is found in all of our major religions. Muslims, like Christianity, like Judaism and like all the major world religions, their fundamental tenets talk about peace and love and forgiveness, not hatred, not terror. It is very important and incumbent upon all of us, and particularly those who strive to become leaders in our society and our nation when these horrible events happen in our world to not divide people, to not point fingers of blame, to not imply that it is because of a particular religion or it is in the tenets of a particular religion to promote terrorism and terrorist acts against people. And that’s why tonight’s gathering is so important to bring us all together, Christians, Muslims and Jews. Here we are today in this room with a Christian member of the City Council, a Jewish Mayor, breaking bread during the Holy Month of Ramadan at an Iftar. The City of Chicago is home to people of all backgrounds and all walks of life. And I am so deeply proud of my mayor, of our mayor, for coming here tonight, for breaking bread, for continuing a tradition he started a few years ago and I trust will continue for many, many years in the future. So thank you Mr. Mayor for coming here tonight. Thank you for honoring all of us with your presence. And thank you my friends for honoring me with your friendship. As I often say, I not only think of myself as the alderman of the 49th ward but I also like to think of myself as the alderman for all of the Muslim community from here in Chicago. Let’s celebrate the fact that we are all here committed to peace, and justice and security for all. 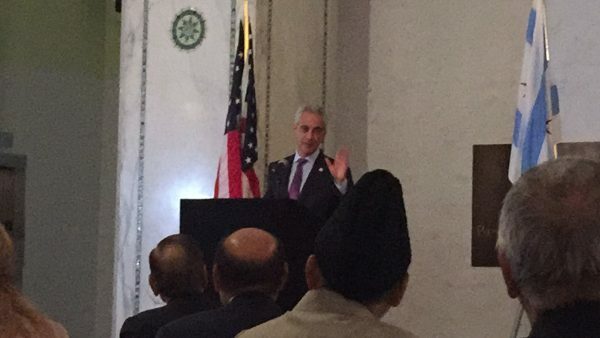 Salman Aftab co-chair of the Iftar event, introduced Mayor Rahm Emanuel. 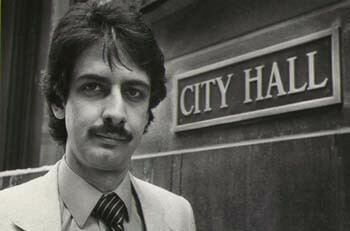 Mayor Emanuel has much for the city and he has done more for his citizens than most. In this time of Islamophobia and vilification, he did not turn his back on us. On the contrary, he sits here with us against those voices who try to separate us. Let us carry the spirit of Ramadan not just today but everyday and let us work with the mayor to bring all Chicagoans regardless of religion or ethnicity together. His leadership is fairness, ladies and gentlemen, he has not kowed to the bigots or the misguided who told us and him not to come here. He is here. I know that this Iftar is very special and Ramadan is very special. As we think about its meaning, the Alderman spoke about something that is very, very important. That is, if you look around the world today, whether it is in Turkey or anywhere around the world, there is both hate, there is violence. There is intolerance. Sometimes it is manifested in violence. Sometimes it is manifested in ugly language. 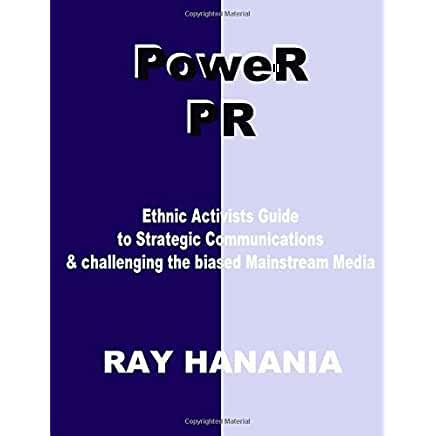 Sometimes it is manifested in political rhetoric that tries to pick on a community or individuals to create a differentiation rather than an understanding. I want this city, a city with a Jewish Mayor and a vibrant Muslim community to send a message loud and clear across this globe. If you offer hate, we offer love. If you offer fear, we offer hope. If you offer intolerance, we offer inclusion. And if that is the message of the the city of Chicago, the city we call home, the city our parents came to like my grandfather. If my grandfather was alive together, he came here 13 years old, by himself to meet a third cousin he never knew, without a word of English he came to Chicago. To get away from the pogroms of Eastern Europe where there was violence set upon him and his family because he was Jewish. He came to this country. Not to any city but this city. That within two generations his grandson would be the mayor of this city speaks volumes of who we are as a city and who we are as a community. I want the rest of the country to see what I see and hear. Whether it is Christian, whether it is Jewish, whether it is Muslim. It has many languages. It has a common understanding of humanity. And it is our inclusion and our hope and our love that will beat out that hate, that fear and that exclusion. This city in this country has always, not just because of what the statue of liberty says, has always strove and been better because it has included others and welcomed them into the arms of humanity. This holiday – I shouldn’t be lecturing what it means because you know it better than me – but as a lesson, this Iftar is a greater understanding and a greater sense of community. And if we stand together, we stand up, we find support with each other and we find solidarity, we can send a message that is more powerful than those who play unfairly. And I said your family made a long journey just like my family. And I don’t think your family thought that when they came to the shores of England or the city of London that their son or great son, a minority in a Muslim community, would one day become mayor. It was those values that we raise our children with. The question or us is not only are those the values that we will raise our children with, but will those be the values we as a city strive for. We are not perfect. There are good days and bad days as we strive for that perfection. I raised my children with the values that where there are differences … and I am very proud of my Jewish heritage in the very way that you are proud of your Muslim heritage, but it has very many ethnicities and you should be proud of it. But it is both that difference that we can understand by also understanding our common future and our common humanity. And if we are successful in teaching that to our children and the best of this holiday in reflection, redemption and striving for betterness that we will be the city we can be. And I hope it is not lost on anybody. And I hope we take what is literally on the walls of this room and make it a part of who we are. As you strive to July 5 at the end of Ramadan, may it be a gracious holiday, a holiday you strengthen in your own faith not only in God but also in our common humanity. THIS POST HAS BEEN READ 3460 TIMES SO FAR. THANK YOU!